“Thanks to those efforts, there are eleven food corporations that have also joined with us, among them McDonald’s, Burger King, Subway, and many more. Today, we are marching with the support of those eleven corporations. And many of the tomato growers also are committed to supporting the changes we have won and working with us. 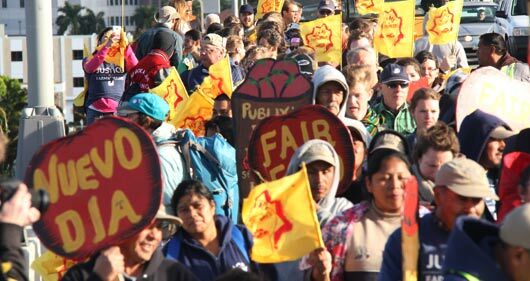 The campaign follows more than a decade of organizing by the CIW, beginning with a campaign against the Florida Fruit and Vegetable Association and then later taking on major tomato purchasers one by one – Taco Bell, MacDonalds, Burger King, and more. Most recently, the CIW and the Florida Tomato Growers Exchange jointly announced a landmark Fair Food Agreement, and the CIW has built the worker-driven Fair Food Program, which ensures standards and compliance for workers’ rights in the field. Along the way, the campaigns have also led to the creation of the Student/Farmworker Alliance, has led to slavery convictions, and to the awarding of the Robert F. Kennedy Human Rights Award. Today marks the ninth day of the march and will go from Palmetto, FL to Ruskin, FL. The march will end on the weekend of March 16th and 17th with a rally at the Publix office. Anyone in the region is invited to come be a part of that historic event. For the rest of us, daily updates and more information are available at the CIW march web site. « previous article: Young Farmers Take to Washington!